(Jo Dungey writes) What is it about sketchers and the weather? 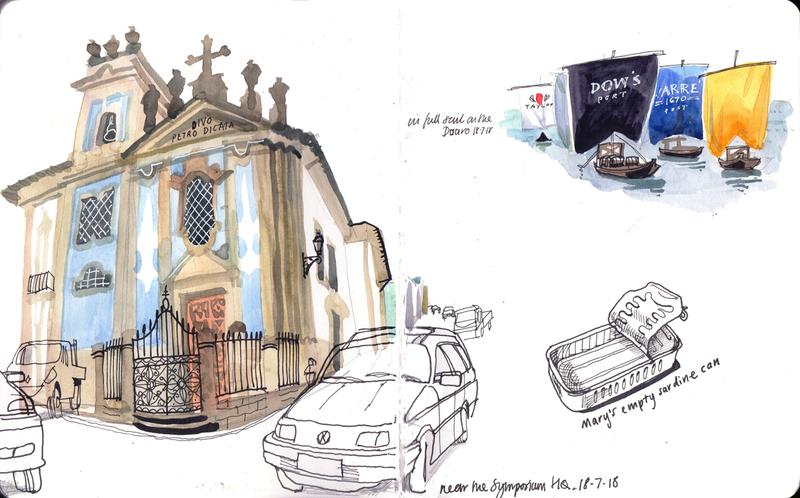 I have never run a sketchcrawl where people did not complain – too cold, too wet, too hot, too uncertain. 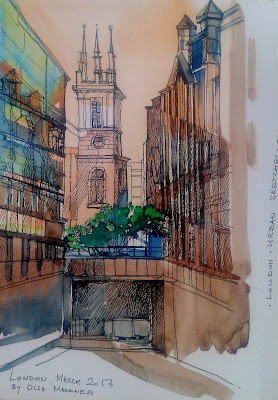 When on Saturday 28 July 2018, we met to sketch at St Katharine Docks, near Tower Bridge, it was Too Windy. Sketches flew, pencils rolled, water bottles were tossed into the air. I quite liked that the over-hot air which had hung over London was replaced by a cooler breeze. But I have come to see these complaints as a form of bragging. Each one of us is J M W Turner, lashed to the ship’s mast to paint the storm. We didn’t just paint the marina full of boats, the converted warehouses, the views across the River Thames. We overcame a sea of troubles and still presented an impressive range of sketches, as ever. We don’t just have sketchbooks to show – each comes with a tale of triumph over adversity. Congratulations all round. Wild dogs tore my sketchbook, and it has the bite marks as proof. Did I ever tell you that story? 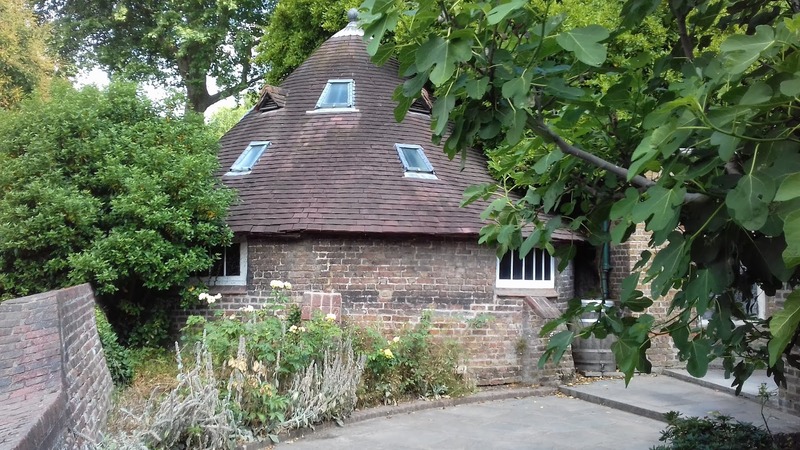 In September we draw at Holland Park and the Design Museum, off Kensington High Street. 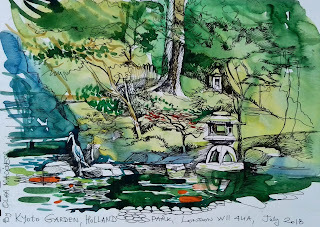 Holland Park offers gardens in different styles including a Japanese garden, more formal gardens, wilder areas, and wandering peacocks. The park has a range of interesting buildings. The Design Museum is located in the former Commonwealth Institute, an innovative building redeveloped by OMA and John Pawson. The day is free of charge, no need to book, just turn up with your art kit. 11 am: Meet the park side of the beautiful decorated gates of Holland Park (see photograph above), next door to the Design Museum. If raining, meet under cover outside the Design Museum. 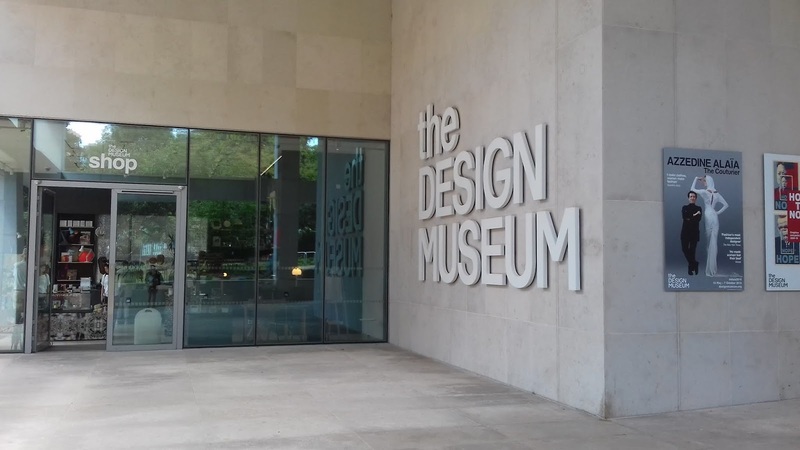 The Design Museum café is not currently open (this could change), but there is a café in Holland Park, or you could stock up on coffee and sandwiches in the area around High Street Kensington underground station. 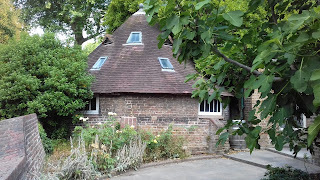 1 pm Meet at the main gates of Holland Park, next door to the Design Museum to look at drawings and take photographs. 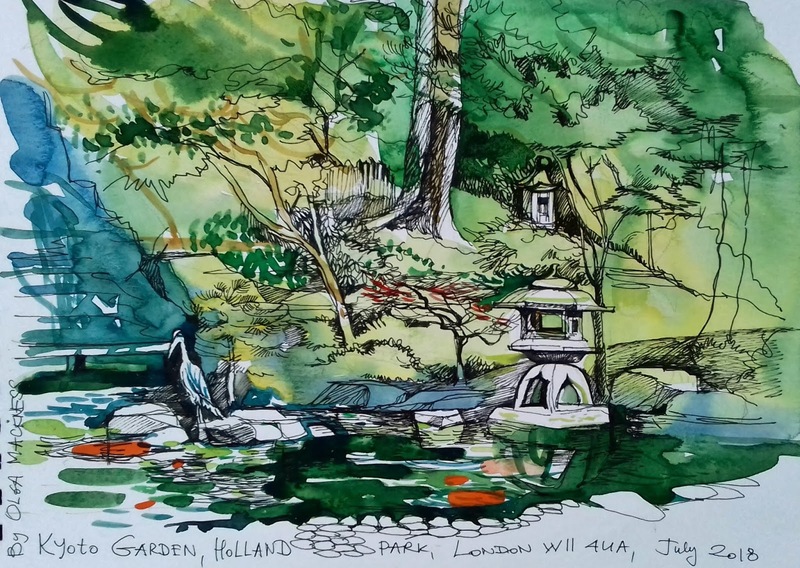 3.30 pm Meet again at the main gates of Holland Park to look at drawings and take final group photographs. Afterwards, we could then go to the Britannia pub a little way down Allen Street, on the opposite side of Kensington High Street, third road on the right - also a good drawing venue: wood-panelled walls and leather arm chairs, real ale. The Design Museum is at 224-238 Kensington High Street – see map below. The Design Museum is a Grade II* listed building and a landmark building from the 1960s previously housing the Commonwealth Institute. It had stood vacant for over a decade, before the site was redeveloped by OMA, and the building interior by John Pawson. It displays contemporary design and innovation. There is a temporary exhibition of Azzedine Alaïa: The Couturier, so several ballgowns to draw. Holland Park is set back from Kensington High Street, along a path beside the Design Museum. 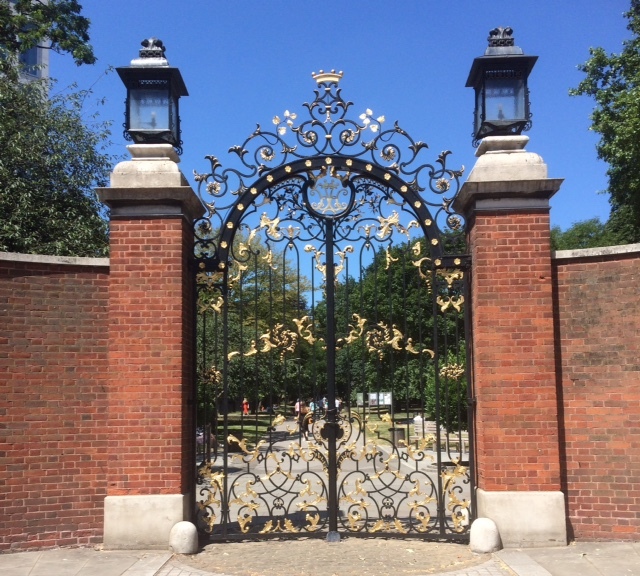 At the entrance are the formal Holland Park gates. The park surrounds a Jacobean mansion, Holland House, named after its second owner, the Earl of Holland, whose wife was the first person in England to successfully grow dahlias. In the 19th century, Holland House became a hub of political and literary activity, visited by Disraeli and Lord Byron amongst others, but was largely destroyed by bombs during World War Two. 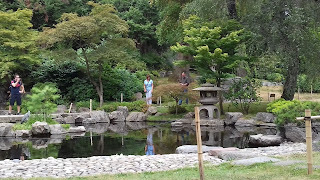 The large park has playing fields, woods and the Kyoto Japanese garden with a waterfall and Koi carp. There are also formal gardens, wandering peacocks, a small cafe, and toilets. Kensington High Street itself has many interesting buildings. 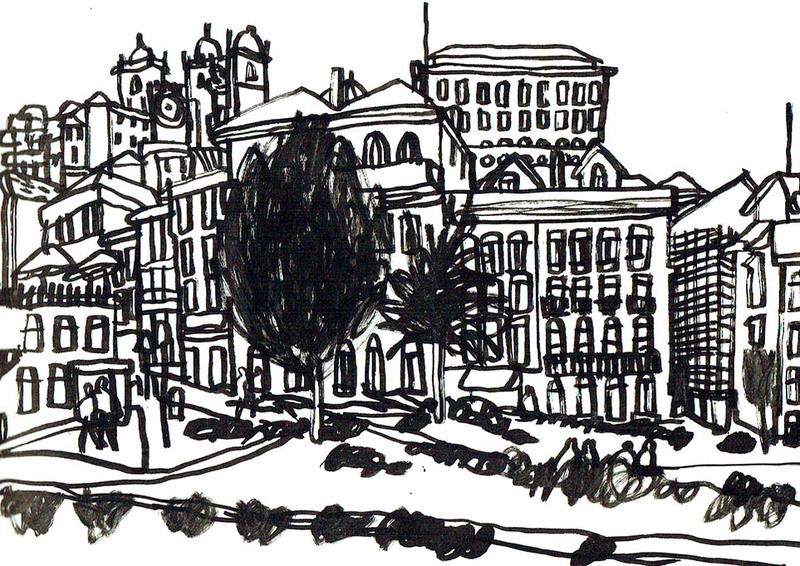 The most fascinating drawing opportunities are the buildings in the squares and streets off the high street. Arrive at High Street Kensington Station on the District and Circle Line. Leaving the station, turn left on Kensington High Street. 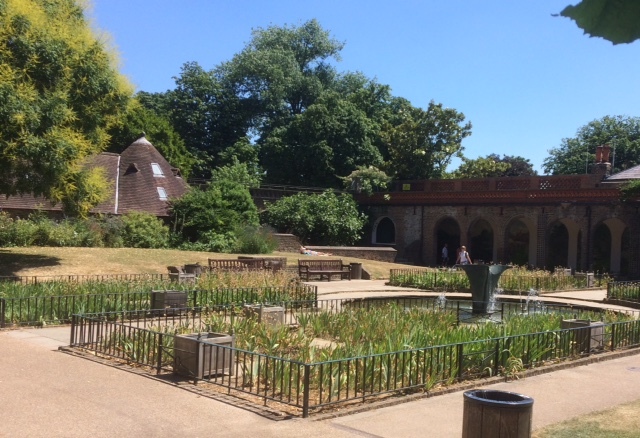 Holland Park and the Design Museum are further along on the other side of the road (just past the Cass Art shop!) Kensington High Street has many cafes and sandwich shops, and there is a café in Holland Park, open 8.30 am to 5.30 pm. 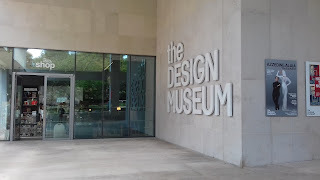 The Design Museum is free to enter but has a charge for some exhibitions. There are toilets in the Design Museum and in the park. The day is run by Nicky Browne and Olga Mackness. 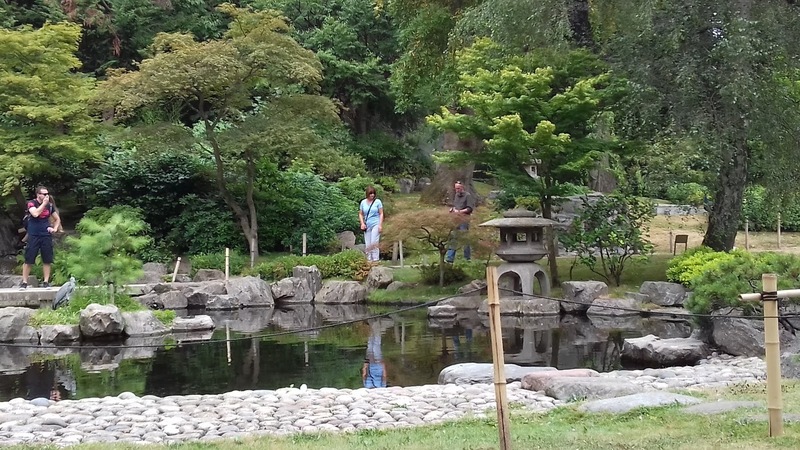 The drawing of the Japanese garden in Holland Park is by Olga, and the photographs are by Nicky and Olga. 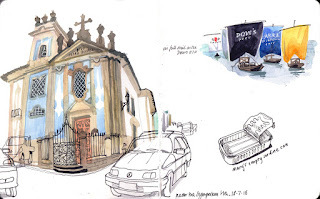 (Jo Dungey writes) The ninth international Urban Sketchers Symposium was held in Porto, Portugal, from 18 to 21 July 2018. 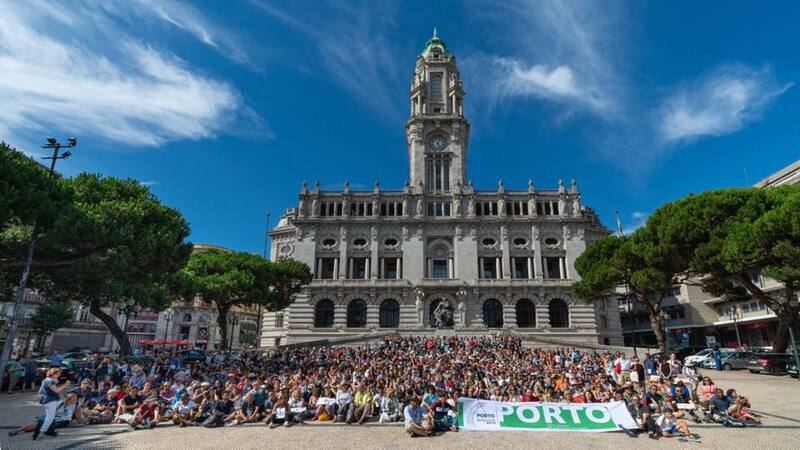 An estimated 800 sketchers and instructors from 48 countries thronged the streets of Porto and the banks of the River Douro. The symposium is an annual event which offers workshops, presentations and sketchcrawls. Most of all, it is a chance to sketch on location and meet others from around the world who also enjoy this. In 2016 the symposium was in Manchester and in 2017 in Chicago, USA. The 2019 symposium will be in Amsterdam from 24 to 27 July 2019. 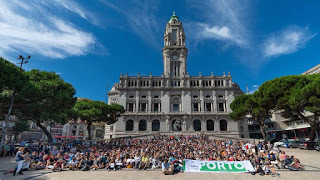 For the Porto event, tickets were put on sale on line in mid-February. The symposium has a reputation for tickets selling out quickly. The Netherlands Urban Sketchers and the international organising committee have taken on a huge challenge – remember that all urban sketchers activities are run entirely by volunteers. Detailed information about the Amsterdam event is not yet published. A link at the head of this blog will provide information as it becomes available on the international urban sketchers website. 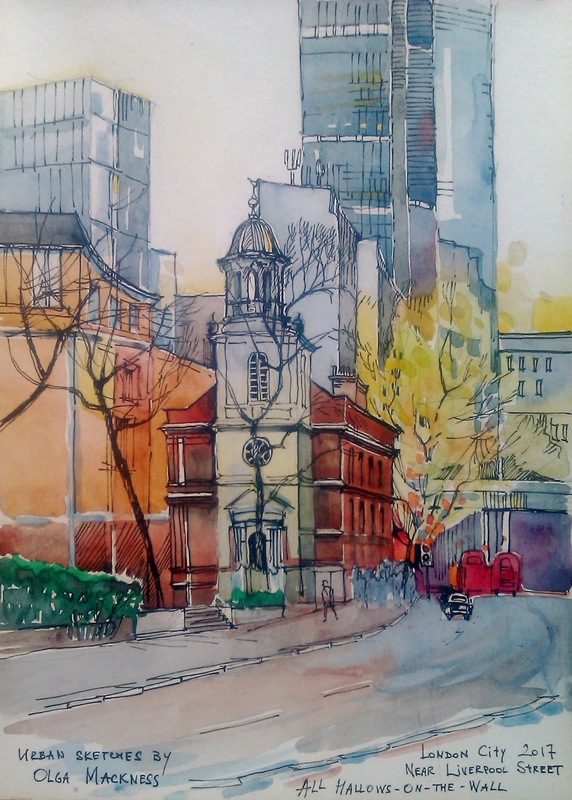 Today I am posting three of the City of London Churches - done in different times. Drawing in the City of London and finding beauty in the contrast between old and new architecture - this is what I call a true happiness. I have visited some of the City of London churches and aim to visit as many as possible, sketching, making notes, learning something fascinating every time. They all on my list and on the map provided by the Friends of the City Churches. I have met those lovely people during my sketch crawl around the City, near St Paul and surrounding streets. There are volunteers in almost every church, who mind the building to allow public visiting. I dedicate this post to them – and hope to join their team one day. St Mary Somerset built in the twelfth century and re-built by Sir Christopher Wren- now converted into private family home! By the way - so is the Tower of the Christchurch Greyfriars Church (the tower and the garden next to Merryl Lynch office, EC1, King Edward Street). I am yet to draw it, but I have had a chance to visit the flat inside of the tower. All Hallows-on-the-Wall. It is a guild Church associated with the Worshipful Company of Carpenters. 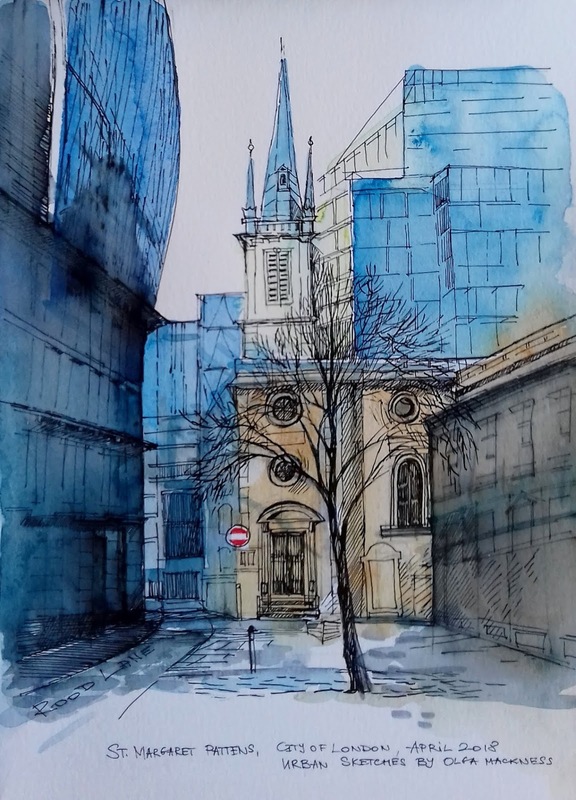 I shall be continuing on this topic, with more of the City Churches and to include Sir Nicholas Hawksmoore churches, famous for their mystic symbols, secrets and architectural mysteries.